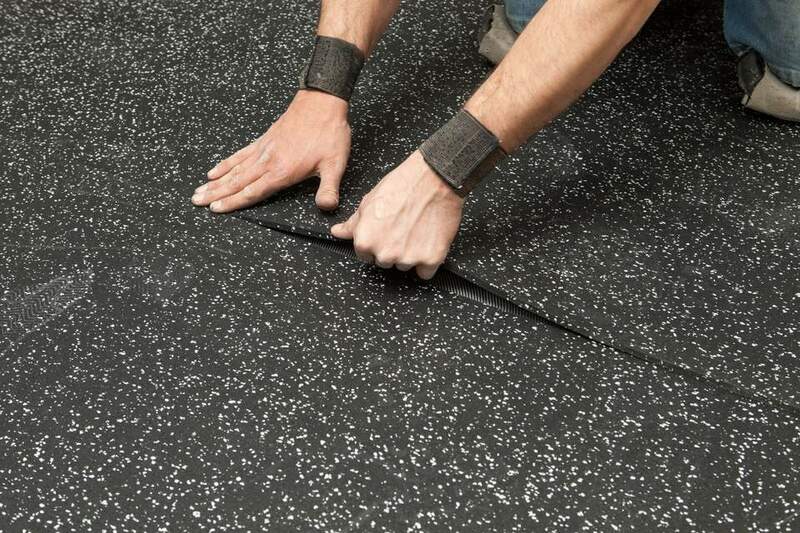 Among the best qualities of rubber flooring is that it is extremely durable and low maintenance. Most liquids will not stain or damage the surface, and it is relatively difficult to damage the material with physical impact, due to its resilient yet yielding nature. Rubber flooring is also resistant to burns and is not susceptible to mold or mildew taking hold. Dirt and debris rest gently on the surface of the rubber, making the floor easy to sweep up. For this reason, rubber tiles are employed in a wide variety of challenging locations, including kitchens, bathrooms, hospitals, playgrounds, and gyms. However, there are some basic cleaning and maintenance steps to follow on a regular basis to both disinfect the floor and keep it looking its best. The most common maintenance issue with a rubber floor is dirt and small debris trekked in by shoes and boots or blown in through windows and air ducts. Rugs at the entrance and exit of every room can help absorb some of it, but dirt is abrasive and can wear down your floor's finish over time if not removed. Cleaning up this debris is a simple matter of sweeping or vacuuming it up on a regular basis (daily or weekly, depending on how much foot traffic the area experiences). If you get a nasty set-in stain on your rubber floor, you can easily wet-wash it with a mop without worrying about damaging the material. Just make sure that any cleaning agent that you use is not acidic or acetone-based, and that it does not contain turpentine. Those substances can all stain a rubber floor, causing permanent and irreparable damage. For an inexpensive and all natural rubber floor cleaning solution, mix one cup of white vinegar into a gallon of hot water. This solution can be applied with a mop, sponge, or cloth in order to clean and disinfect the floor. Add a squeeze of lemon, or a few drops of the essential oil of your choice to the concoction for a fragrant effect. A mild dish soap can be substituted for the vinegar in this solution. You can also mix them all together to create an even more potent cleanser. As always, the ratio of water to cleaning agent will determine how concentrated and effective the cleaner is. In all cases, the water used should be warm-to-hot, and the mix should be changed frequently to keep it clean. If you have a stubborn stain that is deeply set-in, use a concentrated cleaning solution along with a hand brush to apply extra pressure to the floor. You can clean vigorously, but make sure that you don’t press so hard that the bristles of the brush scar the floor. Urine can present a particular problem for rubber flooring, causing set-in stains that just can’t be removed using conventional methods. In this case, a large amount of white toothpaste should be applied to the affected area. Let it dry for 10 to 15 minutes, then wash it off with warm, clean water. This can be done several times until the stain is removed. Any acidic or acetone-based chemical cleansers or any solution that contains turpentine will badly stain your floor. Scouring pads and steel wool sponges can slice and scar the surface of the rubber, damaging it during the cleaning process. Unlike some flooring materials, rubber is not affected by moisture during cleaning and mopping. When done, just allow the floor to air dry to a naturally streak-free finish. Be aware that if your rubber flooring is installed over a plywood subfloor, any standing water on the seams between the tiles could leak, and over time the moisture could cause the subfloor wood to mold or rot. This can be prevented with a vapor barrier underlayment put in during installation. A rubber floor conditioner can be applied to the surface of the floor, either with a cloth by hand, or using a professional grade buffing machine. If you are using a machine, make sure that it operates at less than 350 revolutions-per-minute, or you risk damaging the floor. Periodic conditioning will help to restore the lustrous shine that your rubber floor had when it was first installed. An inexpensive alternative to this is to mix one cup of fabric softener into a gallon of water and mop it on the floor. Done on a regular basis, this should help to restore some of the original glow.